When we choose to battle our anxiety we soon realize that it isn’t simply a battle with anxious feelings, but also with anxious thoughts. You will not see victory over the ingrained habits of worry without addressing the way you think (Phil. 4:8). I refer to this second principle as: change your mind, not your circumstances. Most of us have very little control over our circumstances. You didn’t determine the family into which you would be born. Whether heart disease or cancer may run in your DNA is something over which you have no control. The downward pressure of the economy on your 401K is something outside of your control. Sometimes an employer’s decision to keep you or release you may not even be tied to your performance. While you cannot change those circumstances you can change the way you think about them. God encourages us to do so (Phil. 4:6-8). Here are a few ways you need to change your thinking. You need to change how you think about worry (Phil. 4:6). The Lord is at hand; do not be anxious about anything, but in everything by prayer and supplication with thanksgiving let your requests be made known to God (Phil. 4:5, 6). The phrase “do not be anxious about anything” is in the imperative mood. Simply put, it is a command. That means we shouldn’t see it as optional. Most of us wouldn’t get up in the morning with the intention of breaking 5 of the 10 commandments. But the command, “do not be anxious about anything” is one we don’t take quite so seriously. We need to. When we worry, we ought to repent and ask forgiveness from the Lord for it. We need to acknowledge the truth that he had provided a way out, we just chose not to take it (1 Cor. 10:13). As we think the same thought repeatedly, we develop the habit of thinking it intuitively. It just naturally happens. After a while it begins to feels like it’s something that is happening to us, but really it is just the habitual way we have grown accustomed to thinking about challenges. We worry, as opposed to trust God. This is so important to understand. We are still responsible for our thoughts when we break God’s command about anxiety. We don’t get a pass, just because they have become habitual. 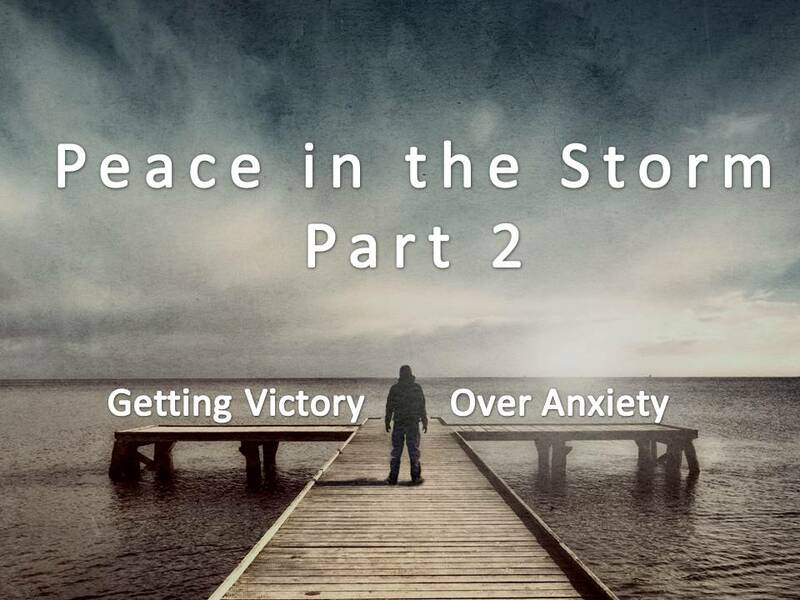 To gain victory, you will need to change how you think about worry. It wasn’t something that just happened. It was something you chose to do. You need to change how you think about prayer (Phil 4:6). When it comes to anxiety, most people see prayer as a last-ditch effort. Usually, we try to handle the difficulty on our own. But, it begins to feel overwhelming. We start to worry. When all else fails…we pray. There are three additional words in this verse that shape out the way we should think about prayer: supplication, thanksgiving, and requests. The word supplication speaks of one’s neediness. We come to the Lord with a spirit of humility that acknowledges our great need. Not just our struggle with the thing we’re worrying about at the moment, but our daily need on the Lord for all things. 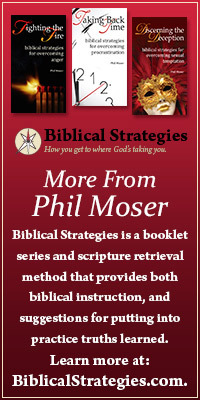 (Go here for a helpful article on learning to pray with 24/7 dependence https://philmoser.com/2012/02/21/give-us-this-day-our-daily-bread/). We need God, not just relief from our circumstances. Thanksgiving means that we express our gratitude to the Lord through prayer. When you only make your prayer about the thing you’re worrying about, you strip out of your prayer a tremendous resource: a grateful heart. If you don’t feel thankful, revisit the end of verse 5. It reminds you the Lord is at hand. God has not left you alone in your struggle. Start by thanking him for that. Notice that your requests come last in this listing. This is by God’s design. You need to develop more fully your pattern of prayer. Another way to say this is: Prayer should be your pattern, not your panic button. When you are praying in a more complete way, you will find that prayer becomes your replacement for worry. When you worry, you try to figure life out on your own. When you pray, you invite God’s strength, wisdom, and sovereign love into the equation. This entry was posted in Trials and tagged anxiety, wprry.